It will be infelicitous for an African to adopt the story of the former United States of America President, Abraham Lincoln in psyching up a youth or elderly person to overcome the psychological effects of defeat or failure when we have President Muhammadu Buhari of the most populous nation in Africa, Nigeria. After an infamous military reign of 1983 to 1985 characterized by an iron-hand rulership that ended prematurely through a coup by Gen. Ibrahim Babangida, Buhari made three failed attempts to rule Nigeria again as a democrat namely in 2003, 2007 and 2011. Buhari comfortably built his supporters' base in the northern part of the country with a resounding strength that failed in its extension to southern part of Nigeria. As a youth corper that served in Bauchi state during the 2011 general elections, I observed the popularity of Buhari among the people in the state under the banner of the Congress for Progressive Change, CPC but when I contacted my friends in the South-west, Dr. Goodluck Ebele Jonathan who later carried the day was more popular. One of my friends jokingly asked if Buhari was truly contesting again at that point in time. In the year, 2014, Buhari at the age of 72 emerged as the flag-bearer of the All Progressives Congress, APC which was majorly a merger of the Congress for Progressive Change and the Action Congress of Nigeria. Gradually, Buhari worked his way into the hearts of the people. Some of those he jailed in the past as a military Head of State started joining his campaign train which was a strong statement for the needed and promised 'change' in the Nigerian polity. Buhari was mocked as a serial loser who was obsessed with the presidential seat. Buhari's victory at the March polls in 2015 can be analyzed from the religious perception screen. His emergence can be likened to a divine arrangement by Providence and his governance of Nigeria in the face of challenging decisions and shortfalls without a surmounting outrage from the public. Nigerians might have been pushed to the wall to overturn the old political behaviour of apathy towards politics while the ruling class under the People's Democratic Party, PDP that planned to rule for 60 straight years out of mere fantasy looted, looted and looted the commonwealth with no near plan to grant 'looting' amnesty. A Nigerian described Buhari as the best of the worst options in the last presidential election. Nigerians virtually never wanted to see the 'Ijaw hat' of Jonathan on the seat of power as well as his wife that created comic relief at regular intervals. It wasn't all about Buhari, it was all about an escape route from Jonathan and Nigerians felt it would be more comfortable to pitch their tent with Buhari following the juicy manifesto of APC, the assumed integrity of Buhari who was intelligently portrayed as a poor man and the grace Lai Mohammed enjoyed during his time as the National Publicity Secretary of the party. In fairness, Buhari is nowhere near Jonathan if both parties are to be weighed on a scale of competence. Buhari looked fragile and tired as he toured Nigeria for political campaigns. He is a man of a few words who recently learned how to smile and laugh publicly. Jonathan was energetic and looked more connected to his people. Buhari's accent wasn't convincing truthfully and most times, one would use an earpiece to decode his words after putting the sound clip on playback. Intellectually, Jonathan was far ahead of Buhari with a doctorate degree while Buhari is still looking for his secondary school leaving certificate which he never misplaced. Financially, Jonathan was better equipped than Buhari as his campaign was thorough and slush funds rumoured to be in the region of N2.2 trillion which is almost half of the 2014 national budget of Nigeria was invested in Jonathan's re-election. The power of incumbency stood in favour of Jonathan under an established party that has cemented its stay in power for 16 years while APC was a mere experimental project of the harmony and coexistence between the northerners and the south-westerners while the Igbos (South-east) were the spectators. Asiwaju Bola Ahmed Tinubu played a herculean role in marketing Buhari to the Yorubas who still nursed fears as they voted on the D-day. PDP alleged through the former Media Director of the Goodluck Ebele Jonathan Campaign Organization in the person of Femi Fani-Kayode that Buhari had strong ties to the Boko Haram sect filled with ''his brothers'' and they also accused him of a secret plot to islamize Nigeria. Every loophole needed to be exploited for political advantage. Jonathan embarked on a church tour/campaign tour with eminent men of God laying hands on him. The Christians were covertly urged by the pastors rumoured to be induced with N7 billion not to cast their votes for the "son of Esau''. Nigerians were strategically divided across tribal lines, religious, economic, education and even age lines. It was invariably the will of the rich against the poor. The affluent who were benefiting from the old order of 'cut for me' assembled behind Jonathan while the poor who were sunk in the perceived integrity of Buhari stood behind him with the hope that he will emasculate the privileged class when he holds the staff of office. Then God showed his interest in the political climate of Nigeria. He wanted to halt the storm and generate sunlight to initiate a photosynthetic reaction. In December, 2014, He reportedly spoke to the Catholic Priest and founder of the Adoration Ministry in Enugu, Rev. Francis Ejike Mbaka that Buhari was the chosen one. Prophet Joseph Oladipupo, the founder and General Overseer of Faith and Victory Church in Akure, Ondo state capital who initially predicted the postponement of the election date from February to March, 2015 revealed God spoke to him that Buhari was his anointed. 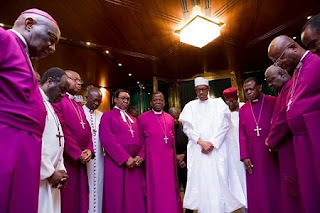 In March, 2015, 6,000 pastors were mobilized in the South-west to pray and fast for 7 days for the ascension of Buhari. According to the pastors under the aegis of Christians for Governance, Pastors for Change held a news conference in Ikeja, Lagos reiterated they were acting on a divine intervention from God who had chosen Buhari to be the next President of Nigeria. Initially, this was sounding blasphemous, but gradually the electorate began to realize that the social contract is only focused on the representation of the general will of the people. Voting preferences on the basis religion, personal economic benefits, social strata, educational background, family ties, geographical ties, party affiliation, tribalism, gender and other standards raised by people are alien to the contract as propounded by Thomas Hobbes. In summary, President Muhammadu Buhari emerged as the leader of the Nigerian people on May 29, 2015 and it hasn't been a rosy path for Nigerians who for once thought they voted for a magician vast in the abracadabra politics. The goodwill from God's endorsement of Buhari seems infinite in the face of massive pitfalls and a debatable 'trial and error administration'. Nigeria has witnessed more of negative changes than the positive ones since Buhari's emergence but we all hope it’s a bearable sacrifice for a greater future. The highlights of Buhari's rulership since May 29, 2015 could convince a reader that it takes a heavenly approval to undertake such changes and still remain in power owing to support or quietness of a large section of the populace. Buhari seems to be basking in the goodwill of the people which shields him from the magnitude of outrage that could threaten his tenure as the president Nigeria. One wonders when Buhari's honeymoon will be over but public trust seems unflinching. This culminated in the snail-speed of Buhari's change agenda as several ministries of government were like headless bodies without an architectural framework to achieve specified goals. It took Buhari 6 months to assemble a cabinet of 'saints' in a fantastically corrupt country which facilitated the ugly and protracted saga of budget padding as the ministers prepared the blueprint of Nigeria's development for the year in less than a month. This led to the national budget of change being tossed between the governmental arms like ping pong till it went missing. The crisis of Senate President Bukola Saraki's trial at the Code of Conduct Tribunal over a 16 count charge of false declaration of assets and corruption while serving as the governor of Kwara state isn't far from the antics of the executive arm coupled with the trial of Saraki and his deputy, Ike Ekweremadu for the forgery of the Senate Standing Order at the Federal High Court in Abuja as initiated by the Attorney General of the Federation and Minister of Justice, Abubakar Malami. Buhari's anti-corruption war abhors the 'umbrella' but spares the 'broom'. This accounts for why smart politicians have jumped ship to the APC so that they could enjoy their loot without harassment. It saddens that heart that only the PDP members are corrupt when over 70% of former PDP members are in the APC currently. One wonders the reluctance of Buhari in unraveling the Halliburton bribery despite the interest of the international community. Apart from this, the anti-graft war is applaudable as gargantuan amounts of money are being recovered from corrupt politicians and office holders. Over 700 unarmed Shiite members were allegedly killed by the Nigerian army in a fracas in Zaria, Kaduna termed as a superiority battle. The leader of the Shiites, Sheikh El Zakzaky alongside his wife have been incarcerated without fair hearing in court for months. An investigative panel set up by the government has struggled to live up to purpose and the avoidable holocaust has gone unanswered in a country where the rule of law is supreme. Harmless Biafra gatherings and lawful protests have been thwarted by security operatives with several civilians killed, injured and others arrested in a bid to silence the separatist ideology and agitations. Nnamdi Kanu who seems to have seen the court room more than a lawyer is being charged for treason with the president stating equivocally clear in the maiden presidential media chat that he is unprepared to grant him freedom. Fulani herdsmen have been wrecking havoc before Buhari's advent but their increased spate of attacks across the geopolitical zones in Nigeria coupled with the non-committal statements made by the President on the mayhem in his first year almost confirms the strong rumour that he is their grand patron. In retrospect, Benue state seems to be the worst hit as people in local communities are constantly raped, kidnapped for ransom, physically attacked, maimed, properties destroyed and killed without any concrete investigation by security agencies to forestall the crisis. Its crystal-clear Buhari isn't comfortable with fighting corruption within the ambit of the law. Buhari cuts corners using a lacuna in the judicial system to re-arrest and detain individuals already granted bail by the court. The cases Sambo Dasuki and former Director General of Nigerian Maritime Administration and Safety Agency, NIMASA; Patrick Akpobolokemi could fit into this description perfectly. The Economic and Financial Crimes Commission's latest affront on the immunity of Governor Ayodele Fayose through the restriction of his personal Zenith Bank accounts over suspicious of fraud is a flagrant mockery of the rule of law in a democratic system. Buhari and his Vice President, Prof Yemi Osinbajo have failed to publicly declare their assets as promised Nigerians before the presidential election as the first test of trustworthiness and accountability. The full addresses of landed properties declared and other details are far from the pages of newspapers which is the norm and the Code of Code Bureau has failed to hand a copy to any media house in fulfillment of the freedom of information act in Nigeria. Buhari's school leaving certificate has also been more elusive than the leader of the Boko Haram sect, Abubakar Shekau but the truth is, Nigerians are more concerned about the results of his tenure than that of his educational status. The problem of insecurity in Nigeria has its roots in many factors and can't be solely attributed to Buhari's administration alone. Boko Haram has been proudly decimated but armed banditry has increased across the geopolitical zones. Cases of armed robbery have continued, kidnappings have skyrocketed with humongous ransoms paid. A disturbing account is the emergence of an armed group in Kaduna that kills freely with the police left with many questions and no answer. Cultism and militancy in the Niger Delta area is on the increase with the government losing count of militant groups emerging by the day. Even the most guarded man in Nigeria made a U-turn for safety on a scheduled trip to Ogoniland due to death threats. My brother, God is the greatest security man in Nigeria oh! Buhari has suffered colossal failure in managing Nigeria's economy. Under his regime, naira was exchanging at a record high of N400 to a dollar in the black market. Even the flotation policy of the Central Bank of Nigeria has refused to ameliorate the situation thereby angering the President. This administration recorded the longest fuel scarcity in Nigeria which left Nigerians at the mercy of black marketers selling fuel at cut throat prices. Inflation has hit a record high of 15.6%, over 60% increase in fuel price, 45% increment in electricity tariffs amidst sharp decline in supply, death of thousands of Small and Medium scale Enterprises, 1.5 million Nigerians lost their jobs in Buhari's first year, food insecurity, record low Gross Domestic Product (-0.36) and unconvincing diversification of Nigeria's economy with over-reliance on crude oil. Medical tourism that incurs financial losses ranging from N1 billion to N3 billion yearly for Nigeria has continued with Buhari failing the test of change by traveling two times to the United Kingdom amidst the scarcity of foreign exchange. It seems Buhari is of the notion that Nigerian doctors can't be trusted with any part of the human body. In conclusion, amidst this string of challenges faced by the Buhari administration, there is no meaningful outrage among the people except a few sponsored protests for common political interests. Even the industrial strike action by the Nigeria Labour Congress to protest the fuel price hike by the Comrade Ayuba Wabba faction ended up as a mere holiday and physical exercise for the civil servants. An outcome of an opinion poll conducted in the six geo-political zones of the country by the International Republican Institute (IRI), an arm of the United States Agency for International Development (USAID) showed participants passed a vote of confidence on Buhari's administration despite the biting hardship, political tussles and uncertainties. What manner of man is this? Does this confirm the saying that when God is with you, nobody can be against you using the religious perspective which is not given full recognition in political science? I leave my readers with these rhetorical questions as I drop my pen.